When I was a kid in the mountatins of northern Arizona, just about anything we wanted to do required driving 45 minutes to two hours, depending on the size of town we needed — three and a half if we were heading to Phoenix for a live show. This meant that the late 80s, for me, had a lot to do with open roads, windows rolled down, warm air coursing through the car with the cassette deck cranked to top volume. That may have been the last time I enjoyed driving. Heading to LA this summer, I worried about the time in the car more than anything else. It’s been five years since I’ve even owned one, and even back when I did drive every day — living in Boston for most of the 90s — I hated to be trapped in traffic. Every minute in the car meant I wasn’t doing something more important. 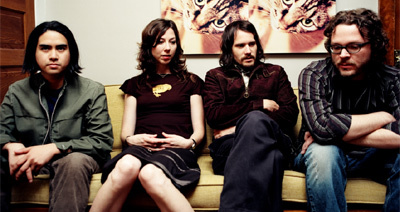 Luckily for me, my five weeks in LA coincided with the summer of love for Silversun Pickups, a band whose sound originates from that late-80s moment of my carefree summer driving. Carnavas, the first full-length from the reigning royalty of the Silver Lake indie scene, came out on Dangerbird in late July, but friends had been floating advance copies for weeks, and those California mornings I wanted to feel free and easy — especially when traffic broke up and I could really fly — this is the disc I wanted on. “I can tell it’s summer from the size of bugs that fly through my window,” Brian Aubert sings on “Rusted Wheel,” as if he designed the song for the freeway. To say SSPU’s sound dates to the late 80s is to cut against the grain of most criticism on the band, which seems obliged to make the obvious comparison to Smashing Pumpkins’ Siamese Dream (1993). You’ll even read about them ushering in a 90s revival. Maybe so. But to me SSPU’s breath of fresh air has just as much to do with the little noted continuities between post-punk’s waning years in the late 80s and the arrival of 90s indie pop mid-decade, welcome relief for grunge-filled arteries. SSPU’s fuzzed-up guitars, that is, have as much to do with the Jesus and Mary Chain as they do with My Bloody Valentine, and you can hear echoes of the Cure’s rhythm guitar everywhere (just as you can on many early Pixies and Pavement tracks); try the end of “Waste It On” and the beginning of the exquisite “Lazy Eye,” for example, or fast forward to the wall-of-sound finale that track builds toward, which owes more than a little to Eno producing the Edge. (If you think I’m kidding listen to the Edgy atmospherics at the beginning of “Dream at Tempo 119” as well.) Long before Billy Corgan pulled up in his icecream truck there was that beautiful moment in 1988 when Sonic Youth reminded the world they’d been honing their craft for almost a decade. Light your candles during “Teenage Riot,” friends. 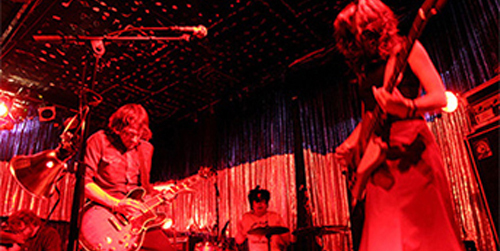 Daydream Nation was the sound of an ending era. Nirvana was right around the corner, sure, but thank God it hadn’t arrived yet. If frontman Aubert can’t help but conjure up comparisons to Corgan, the Sonic Youth comparisons come easily too — not least because Nikki Monniger, who plays thick, bouncy, complexly syncopated bass lines, channels Kim Gordon so well. If you were to take Sonic Youth’s angular rhythm section (SSPU’s Christopher Guanlao’s drumming is nothing if not disciplined and artfully unleashed) and add a heavy dose of Grandaddy’s electronic noise (provided for the Pickups by keyboardist Joe Lester) you’d start to approximate the sound storm they’ve channeled into the eleven tracks on Carnavas. More than anything, what makes Carnavas the driving album of the summer is the songs’ roominess. Nothing here is winnowed down to a three-minute radio edit. Songs build, transition, unfold, open up — four, five, six minutes long. Percussion lines claim plenty of elbow room between verses; choruses stretch and repeat to downright daring lengths. Infectious hooks and poppy melody lines abound, but the songs that turn the corner toward revolution — when Aubert’s coy boy vocals, or what critics love to call his “androgynous” duets with Monniger, fall by the wayside and he lays into an open-throated howl — those are the moments when the incredible energy of the band’s live show manifests itself most on the record. “Future Foe Scenarios,” my favorite SSPU track (yes, even more than “Kissing Families” from the earlier Pikul EP) is exactly the sort of song I’m talking about. The martial beat, the electronic beeps that seem to come from outerspace, the intricately layered guitar lines: everything serves to build a sonic wave for Aubert to scream over, beginning about two minutes into the track, as if he just crawled out of the bomb shelter and surveyed the revolution’s results. “It’s alright,” he tries to reassure us at the song’s end, but the rest of the band is busy telling a different story, a broken radio warning signal repeating and repeating as if unmanned. There’s nothing left to do but turn up the volume (while Nikki’s chromatic scale kicks off the next song) and let the wind ruffle your hair and slap your face as you drive into the apocalyptic sunset. Next week: Songs for the end of a late-summer night. Nice writing. Strange, they have two white guys, a lady, and a gentleman of, what appears to be, asian extraction. Can a shaved head and Madison Square Garden be far behind? Yes, it is a fabulous album and captures most of what makes their live sets so incredible as well… I wish you could have been there at the recent Troubadour show, the last show of their recent tour, which was so so fun. Just got the album a couple of days ago. Haven’t had a chance to listen to it while driving more than the 4-5 minutes to work, but I can see why it would be a great record to play on a long drive. Looking forward to seeing them in Portland in October as well. As for Pitchfork…maybe it’d help to get it reviewed if they had more X’s in their name. XiuSilversun XiuPickups perhaps? they passed through philly a few weeks ago and despite ungodly temperatures and a not sold out show, they played their set at full gallop. it was tremendous. i strongly recommend seeing them live AS WELL AS hearing the studio production. I love their new album. thanks for the brainy review bryan. it is incomprehensible that they have not been more widely reviewed yet. I had a chance to see the SSPUs only once so far, and was quite impressed. As a rhythm-section snob, I am, perhaps, a little too critical, and live bands often disappoint me. The SSPUs, however, were tight enough that their songs held together and loose enough that their sound had a beautifully swirling spontaneity (Bryan you were right to mention My Bloody Valentine). As an audience member, I felt a little overwhelmed by the huge sound, but reassured by Brian (the singer’s) between song banter. He reminded me of the one dude at a drug party you can go to for reassurance when you feel like your face is melting. He’s all: “Dude, just chill out. Let the drugs take you where they want to take you. Don’t try to control the vibe.” Yeah, these guys are good, and I’m really glad they are doing as well as they are. Scott — somehow I imagine *you* being that guy too. Oh Mr./Ms. Dogfight, that is, perhaps, the “highest” complement I’ve ever received. so i was just hanging out at fresh salt, where carnavas was playing. as good as it sounds in a car on the freeway, it sounds pretty good at happy hour too. 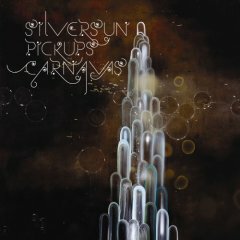 how can i get a piece of this silversun action? only in your dreams, baby. they’re way out of your league.